Lock in a great price for Romantik Hotel Walhalla – rated 8.8 by recent guests! The location is excellent for walking and exploring town. Many shops and restaurants near by. The property is charming, the attached restaurant is fabulous and the people are very nice and helpful l.
The location was great. The staff was very nice and helpful. Loved the courtyard area. The location in the middle of the historic centre. The large room with a terrace at a quiet courtyard. The kindness of the staff. Large room, very comfortable bed, historic building, in the centre of the old town, easy to access, tasty complimentary breakfast, helpful staff, great value. The service we experienced from everyone we met was wonderful. The WiFi is the best we have accessed anywhere in Europe. The breakfast was excellent well above the average hotel offerings. Great fishtank in the lobby with life size sharks and turtles. Also a fabulous poolside trampoline. Nice and very beautiful restaurant . The location is great . In the middle of the historic City centre . Friendly staff, spotlessly clean and a great breakfast. Romantik Hotel Walhalla This rating is a reflection of how the property compares to the industry standard when it comes to price, facilities and services available. It's based on a self-evaluation by the property. Use this rating to help choose your stay! 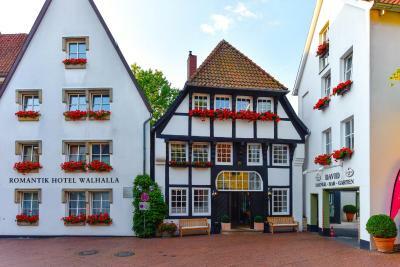 The Romantik Hotel Walhalla offers modern rooms and a traditional restaurant within a historic timber-framed building. It is located in the historic district of Osnabrück, across from the market square. All of the rooms at the 4-star Walhalla include a modern bathroom, high-quality furniture and a minibar. The Romantik Hotel offers a German-style breakfast buffet each morning. The Restaurant Walhalla features a summer terrace, and serves regional cuisine and fine wines. A range of spa facilities are available at the Walhalla, such as a bio sauna, a steam room and a solarium. Cosmetic treatments are also available upon request. The Theater Osnabrück is just 800 feet away. When would you like to stay at Romantik Hotel Walhalla? Homelike room with a TV, telephone and private bathroom with hairdryer. Homelike room with a TV, telephone and private bathroom with hairdryer. Guests may choose between a double bed or 2 separate single beds. House Rules Romantik Hotel Walhalla takes special requests – add in the next step! Romantik Hotel Walhalla accepts these cards and reserves the right to temporarily hold an amount prior to arrival. Lovely hotel, good location, clean and comfortable room. Breakfast nice, not extensive choice but enough for a nice breakfast. We've stayed here three times over the years and will return. Perfect location in the middle of the old city. Comfortable rooms. Parking/Garage. Friendly personnel. High class restaurant. Comfortable bar with the full range of cocktails, drinks and really tasty snacks. Medieval rooftops view from the lanai. Warm and cozy room. Relaxing bed. Delicious breakfast. Nice smiling personnel. Very comfortable, good location, good breakfast. Extremely friendly service, very good dinner and excellent breakfast. Located in the old city confines, so a walk is very pleasant in an old setting. The room had nothing to do with the pictures that are displayed and for the price a real disappointment. No cozy bathroom, instead an old and worn out shower and toilet. The bed was very uncomfortable. We felt like in a two star motel. We are very disappointed and and do not recommend it. Friendly helpful staff. The breakfast was delicious. I can recommend dinner in the restaurant. We had an excellent meal with great wines. 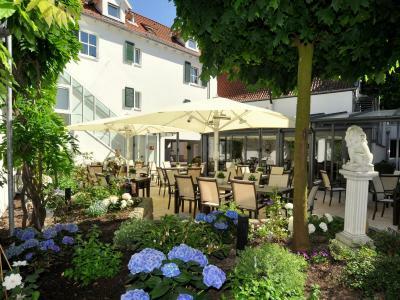 The hotel is located in the historic centre of Osnabrück.